There are tons of ways to make a Christmas wedding fun and special for your guests!I love this time of year, and what better way to set your ceremony apart from the rest than doing an all-out Christmas wedding theme? Decorate your indoor or outdoor wedding ceremony with a few Christmas themed touches that will amaze your guests and get them in the holiday spirit. Here are some simple ideas for your wedding ceremony site, both indoors and outdoors. Wreaths are a favorite of mine, and I use them throughout the year as decoration. For Christmas time they are a natural fit, and you can use all natural pine wreaths or heavily decorated artificial ones depending on your particular style. They look great flanking double doors, which are prevalent at many churches, and you can also create a dramatic wedding arch by hanging a trio of wreaths from the ceiling. A large wreath in the center flanked by two smaller ones works best. Use ten to twelve yards of gauzy fabric like tulle or chiffon to drape through the wreaths, allowing for a bit to drape between each ring, and some to cascade down the left and right side. Tip: Pine wreaths and garland are plentiful and inexpensive around this time, so take advantage of this and use the REAL THING! The smell will be amazing and you won't have to spend a ton of cash. Live garland also works well for your wedding aisle decorations will be the perfect touch for your Christmas wedding. A bit of gorgeous ribbon will make this an even lovelier decoration for you wedding aisle. Get into the season by wrapping miniature boxes for your Christmas wedding favors. You can fill them with Christmas candy, holiday cookies or some other small favor as a thank you to your guests for being a part of your big day. Wanna' get your guests in the spirit for your Christmas wedding? An eggnog martini or delicious Christmas punch will be a hit for your cocktail hour. Use Christmas ornaments- For a seasonal wedding, Christmas ornaments are an inexpensive and versatile item that can be used throughout your wedding decorations. Ornaments hung overhead with fishing wire just about anywhere! Frosted or Plain Pinecones can be used in much the same way as Christmas ornaments can so if rustic Christmas decoration is more your style go with them instead. Pine cone centerpieces are a snap to make. Just fill the bottom of a wide column vase with some artificial snow, the kind you'd find at any dollar store around Christmas time, then add a few pinecones to fill the vase about halfway. Voila! How easy can it get? A little glue and Styrofoam and you can also use pinecones to create an amazing topiary. You can clip off the pointed ends with snippers, or leave them be. Glue neatly around your form and leave natural or spray paint metallic gold, silver or copper for a more festive look. 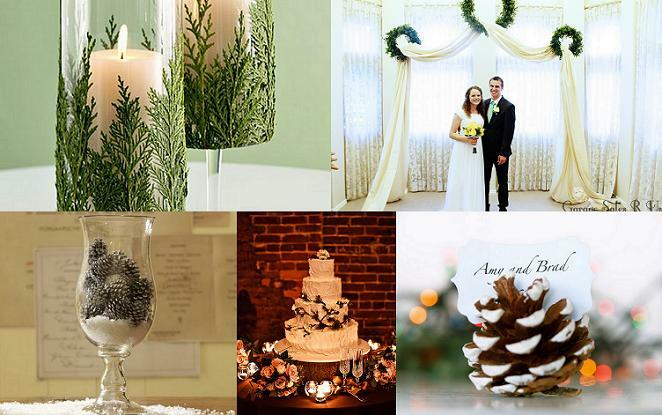 Sugar Pine Cones on your Wedding Cake! You can create DIY popcorn decorations and favors for a rustic, homey Christmas theme. Popcorn garland makes great decoration. You can drape it across your welcome table, or decorate a Manzanita or Christmas tree with it. Popcorn balls will make an awesome wedding favor for this Christmas wedding theme, and they're super easy to do! You'll may actually enjoy putting them together with your family and bridesmaids. You can use wrapped boxes as wedding altar decoration, stacking boxes on top of each other banking your wedding arch. Wrapping paper also makes cute decorations for your wedding reception. Use them to create wheel fan flowers! You can find a few patterns or colors you like and create them in different sizes. I like to use them as decoration for candy station backgrounds. Use them to create a traditional paper chain garland. Garland is a favorite wedding decoration of mine no matter the season. You can use it to decorate your wedding aisle, to drape tables, or ceiling areas.